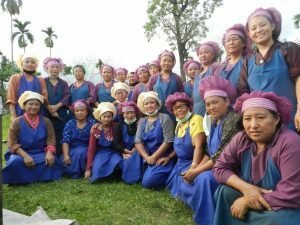 SABAH Bhutan and Serchok Women’s Group of Gelephu are working towards setting up and operating a food processing unit through the 24 months project “Empowering Women to achieve livelihood through natural food production”. This partnership is a showcase to exemplify the importance of coordination, governance and mutual support of a CSO and CBO in livelihood improvement projects. More than 100 women from Sarpang, Bumthang, Pema Gatshel and TrashigangDzongkags will be trained on basic food processing, handling and packaging. A food processing unit will be established, operated and managed entirely by the women’s group, with the aim to provide sustained employment to the members, as well as benefit grower groups and suppliers in the value chain. 30 new women have been identified and briefed on membership in Pema Gatshel and Sarpang. The women are currently working and processing the products in their homes and have reported inability to maintain uniformity and sanitation requirements for food product standards laid out by the government.